As a child, you may have made suspensions such as mixtures of mud and water, flour and water, or a suspension of solid pigments in water, known as tempera paint. These suspensions are heterogeneous mixtures composed of relatively large particles that are visible (or that can be seen with a magnifying glass). They are cloudy, and the suspended particles settle out after mixing. On the other hand, when we make a solution, we prepare a homogeneous mixture in which no settling occurs and in which the dissolved species are molecules or ions. Solutions exhibit completely different behavior from suspensions. A solution may be colored, but it is transparent, the molecules or ions are invisible, and they do not settle out on standing. 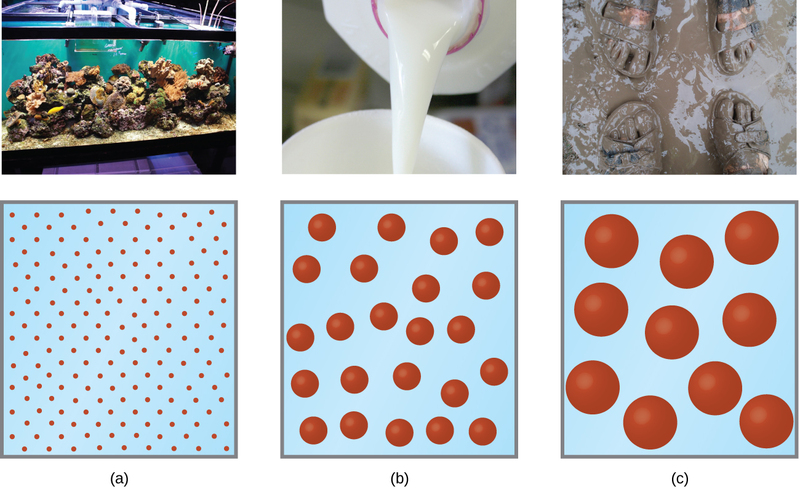 A group of mixtures called colloids (or colloidal dispersions) exhibit properties intermediate between those of suspensions and solutions ([link]). The particles in a colloid are larger than most simple molecules; however, colloidal particles are small enough that they do not settle out upon standing. The particles in a colloid are large enough to scatter light, a phenomenon called the Tyndall effect. 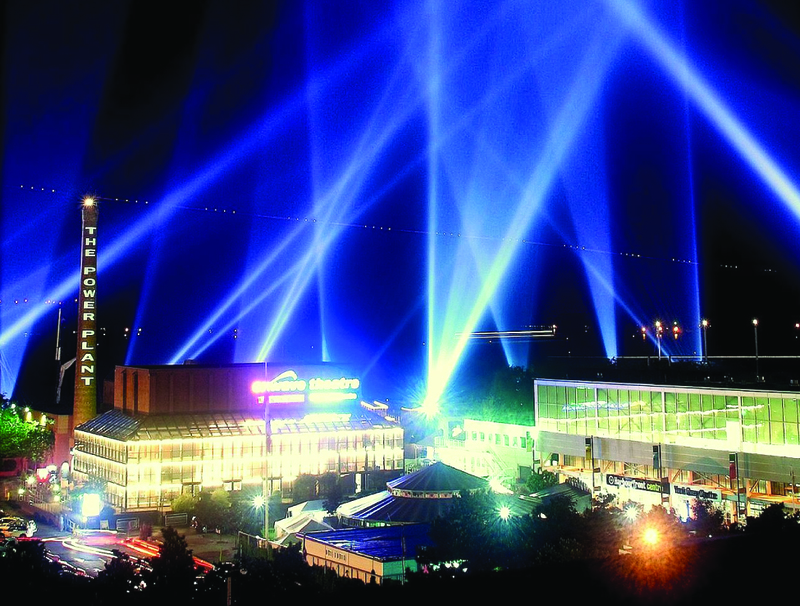 This can make colloidal mixtures appear cloudy or opaque, such as the searchlight beams shown in [link]. Clouds are colloidal mixtures. They are composed of water droplets that are much larger than molecules, but that are small enough that they do not settle out. The term “colloid”—from the Greek words kolla, meaning “glue,” and eidos, meaning “like”—was first used in 1861 by Thomas Graham to classify mixtures such as starch in water and gelatin. Many colloidal particles are aggregates of hundreds or thousands of molecules, but others (such as proteins and polymer molecules) consist of a single extremely large molecule. The protein and synthetic polymer molecules that form colloids may have molecular masses ranging from a few thousand to many million atomic mass units. Analogous to the identification of solution components as “solute” and “solvent,” the components of a colloid are likewise classified according to their relative amounts. The particulate component typically present in a relatively minor amount is called the dispersed phase and the substance or solution throughout which the particulate is dispersed is called the dispersion medium. Colloids may involve virtually any combination of physical states (gas in liquid, liquid in solid, solid in gas, etc. ), as illustrated by the examples of colloidal systems given in [link]. Dispersion methods: that is, by breaking down larger particles. For example, paint pigments are produced by dispersing large particles by grinding in special mills. Condensation methods: that is, growth from smaller units, such as molecules or ions. For example, clouds form when water molecules condense and form very small droplets. A few solid substances, when brought into contact with water, disperse spontaneously and form colloidal systems. Gelatin, glue, starch, and dehydrated milk powder behave in this manner. The particles are already of colloidal size; the water simply disperses them. Powdered milk particles of colloidal size are produced by dehydrating milk spray. Some atomizers produce colloidal dispersions of a liquid in air. We can prepare an emulsion by shaking together or blending two immiscible liquids. This breaks one liquid into droplets of colloidal size, which then disperse throughout the other liquid. Oil spills in the ocean may be difficult to clean up, partly because wave action can cause the oil and water to form an emulsion. In many emulsions, however, the dispersed phase tends to coalesce, form large drops, and separate. Therefore, emulsions are usually stabilized by an emulsifying agent, a substance that inhibits the coalescence of the dispersed liquid. For example, a little soap will stabilize an emulsion of kerosene in water. Milk is an emulsion of butterfat in water, with the protein casein as the emulsifying agent. Mayonnaise is an emulsion of oil in vinegar, with egg yolk components as the emulsifying agents. Some gold sols prepared in 1857 are still intact (the particles have not coalesced and settled), illustrating the long-term stability of many colloids. Pioneers made soap by boiling fats with a strongly basic solution made by leaching potassium carbonate, K2CO3, from wood ashes with hot water. Animal fats contain polyesters of fatty acids (long-chain carboxylic acids). When animal fats are treated with a base like potassium carbonate or sodium hydroxide, glycerol and salts of fatty acids such as palmitic, oleic, and stearic acid are formed. The salts of fatty acids are called soaps. The sodium salt of stearic acid, sodium stearate, has the formula C17H35CO2Na and contains an uncharged nonpolar hydrocarbon chain, the C17H35— unit, and an ionic carboxylate group, the — unit ([link]). Soaps contain a nonpolar hydrocarbon end (blue) and an ionic end (red). The ionic end is a carboxylate group. The length of the hydrocarbon end can vary from soap to soap. Detergents (soap substitutes) also contain nonpolar hydrocarbon chains, such as C12H25—, and an ionic group, such as a sulfate— or a sulfonate— ([link]). Soaps form insoluble calcium and magnesium compounds in hard water; detergents form water-soluble products—a definite advantage for detergents. Detergents contain a nonpolar hydrocarbon end (blue) and an ionic end (red). The ionic end can be either a sulfate or a sulfonate. The length of the hydrocarbon end can vary from detergent to detergent. The cleaning action of soaps and detergents can be explained in terms of the structures of the molecules involved. 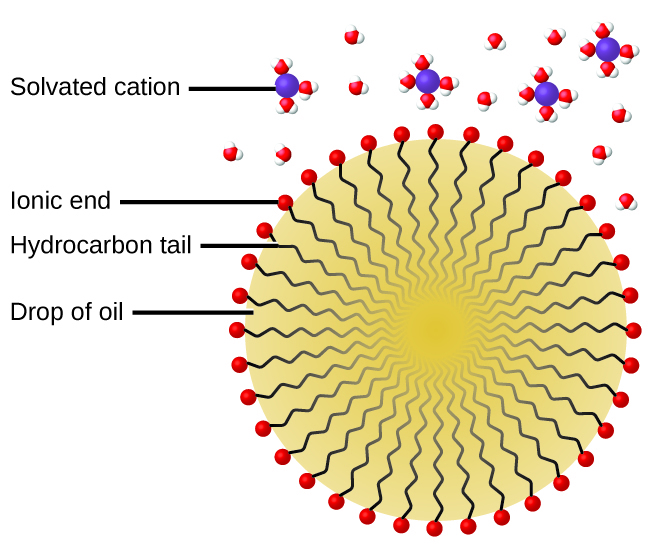 The hydrocarbon (nonpolar) end of a soap or detergent molecule dissolves in, or is attracted to, nonpolar substances such as oil, grease, or dirt particles. The ionic end is attracted by water (polar), illustrated in [link]. As a result, the soap or detergent molecules become oriented at the interface between the dirt particles and the water so they act as a kind of bridge between two different kinds of matter, nonpolar and polar. Molecules such as this are termed amphiphilic since they have both a hydrophobic (“water-fearing”) part and a hydrophilic (“water-loving”) part. As a consequence, dirt particles become suspended as colloidal particles and are readily washed away. This diagrammatic cross section of an emulsified drop of oil in water shows how soap or detergent acts as an emulsifier. The blowout of the Deepwater Horizon oil drilling rig on April 20, 2010, in the Gulf of Mexico near Mississippi began the largest marine oil spill in the history of the petroleum. In the 87 days following the blowout, an estimated 4.9 million barrels (210 million gallons) of oil flowed from the ruptured well 5000 feet below the water’s surface. The well was finally declared sealed on September 19, 2010. Crude oil is immiscible with and less dense than water, so the spilled oil rose to the surface of the water. Floating booms, skimmer ships, and controlled burns were used to remove oil from the water’s surface in an attempt to protect beaches and wetlands along the Gulf coast. In addition to removal of the oil, attempts were also made to lessen its environmental impact by rendering it “soluble” (in the loose sense of the term) and thus allowing it to be diluted to hopefully less harmful levels by the vast volume of ocean water. This approach used 1.84 million gallons of the oil dispersant Corexit 9527, most of which was injected underwater at the site of the leak, with small amounts being sprayed on top of the spill. Corexit 9527 contains 2-butoxyethanol (C6H14O2), an amphiphilic molecule whose polar and nonpolar ends are useful for emulsifying oil into small droplets, increasing the surface area of the oil and making it more available to marine bacteria for digestion ([link]). While this approach avoids many of the immediate hazards that bulk oil poses to marine and coastal ecosystems, it introduces the possibility of long-term effects resulting from the introduction of the complex and potential toxic components of petroleum into the ocean’s food chain. A number of organizations are involved in monitoring the extended impact of this oil spill, including the National Oceanic and Atmospheric Administration (visit this website for additional details). Dispersed colloidal particles are often electrically charged. A colloidal particle of iron(III) hydroxide, for example, does not contain enough hydroxide ions to compensate exactly for the positive charges on the iron(III) ions. Thus, each individual colloidal particle bears a positive charge, and the colloidal dispersion consists of charged colloidal particles and some free hydroxide ions, which keep the dispersion electrically neutral. Most metal hydroxide colloids have positive charges, whereas most metals and metal sulfides form negatively charged dispersions. All colloidal particles in any one system have charges of the same sign. This helps keep them dispersed because particles containing like charges repel each other. We can take advantage of the charge on colloidal particles to remove them from a variety of mixtures. If we place a colloidal dispersion in a container with charged electrodes, positively charged particles, such as iron(III) hydroxide particles, would move to the negative electrode. There, the colloidal particles lose their charge and coagulate as a precipitate. The carbon and dust particles in smoke are often colloidally dispersed and electrically charged. Frederick Cottrell, an American chemist, developed a process to remove these particles. Born in Oakland, CA in 1877, Frederick Cottrell devoured textbooks as if they were novels and graduated from high school at the age of 16. He then entered the University of California (UC), Berkeley, completing a Bachelor’s degree in three years. He saved money from his 1200 annual salary as a chemistry teacher at Oakland High School to fund his studies in chemistry in Berlin with Nobel prize winner Jacobus Henricus van’t Hoff, and in Leipzig with Wilhelm Ostwald, another Nobel awardee. After earning his PhD in physical chemistry, he returned to the United States to teach at UC Berkeley. 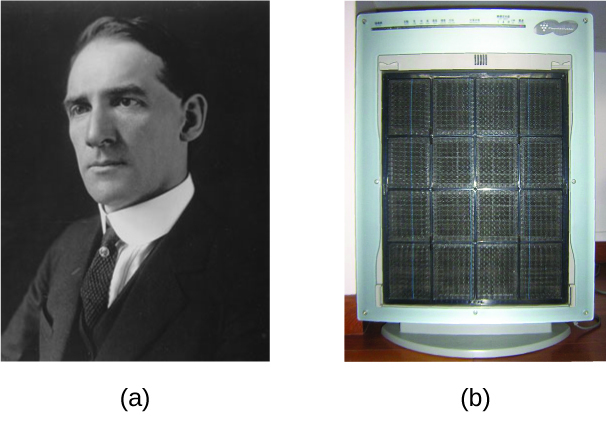 He also consulted for the DuPont Company, where he developed the electrostatic precipitator, a device designed to curb air pollution by removing colloidal particles from air. Cottrell used the proceeds from his invention to fund a nonprofit research corporation to finance scientific research. The charged particles are attracted to highly charged electrodes, where they are neutralized and deposited as dust ([link]). This is one of the important methods used to clean up the smoke from a variety of industrial processes. The process is also important in the recovery of valuable products from the smoke and flue dust of smelters, furnaces, and kilns. There are also ionic air filters designed for home use to improve indoor air quality. 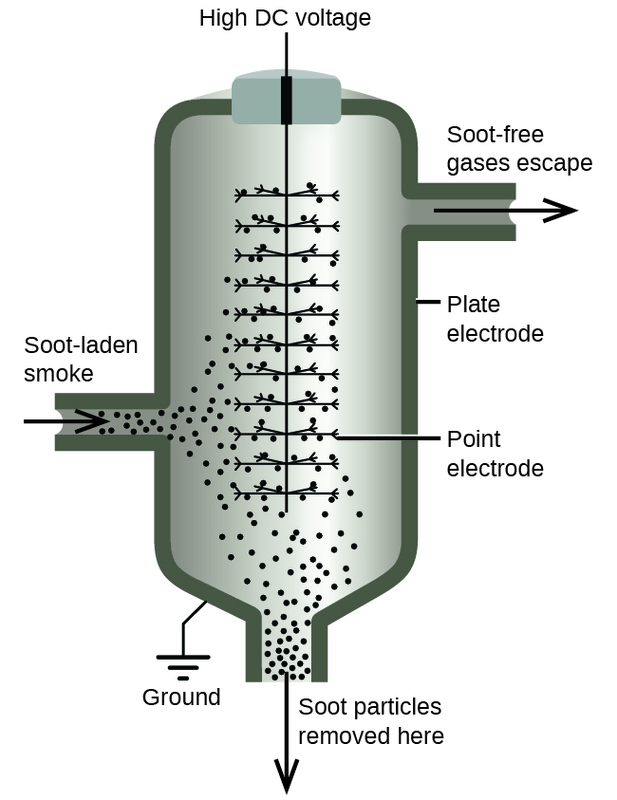 In a Cottrell precipitator, positively and negatively charged particles are attracted to highly charged electrodes, where they are neutralized and deposited as dust. 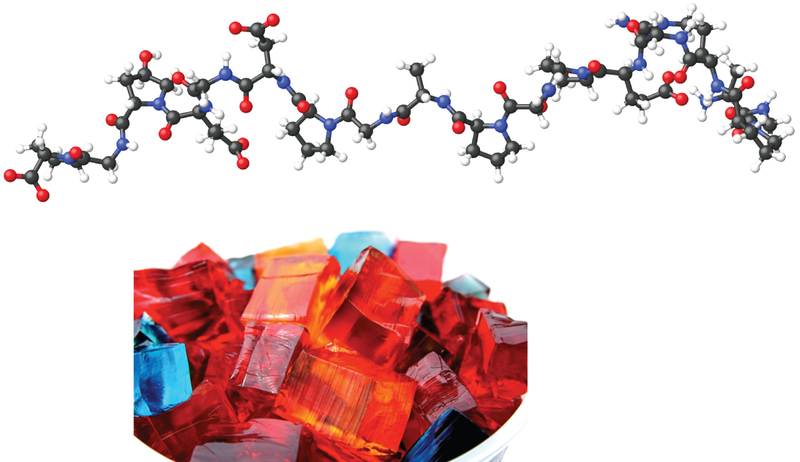 When we make gelatin, such as Jell-O, we are making a type of colloid ([link]). Gelatin sets on cooling because the hot aqueous mixture of gelatin coagulates as it cools and the whole mass, including the liquid, sets to an extremely viscous body known as a gel, a colloid in which the dispersing medium is a solid and the dispersed phase is a liquid. It appears that the fibers of the dispersing medium form a complex three-dimensional network, the interstices being filled with the liquid medium or a dilute solution of the dispersing medium. Because the formation of a gel is accompanied by the taking up of water or some other solvent, the gel is said to be hydrated or solvated. Pectin, a carbohydrate from fruit juices, is a gel-forming substance important in jelly making. Silica gel, a colloidal dispersion of hydrated silicon dioxide, is formed when dilute hydrochloric acid is added to a dilute solution of sodium silicate. Canned Heat is a gel made by mixing alcohol and a saturated aqueous solution of calcium acetate. Identify the dispersed phase and the dispersion medium in each of the following colloidal systems: starch dispersion, smoke, fog, pearl, whipped cream, floating soap, jelly, milk, and ruby. Distinguish between dispersion methods and condensation methods for preparing colloidal systems. How do colloids differ from solutions with regard to dispersed particle size and homogeneity? Colloidal dispersions consist of particles that are much bigger than the solutes of typical solutions. Colloidal particles are either very large molecules or aggregates of smaller species that usually are big enough to scatter light. Colloids are homogeneous on a macroscopic (visual) scale, while solutions are homogeneous on a microscopic (molecular) scale. How can it be demonstrated that colloidal particles are electrically charged? If they are placed in an electrolytic cell, dispersed particles will move toward the electrode that carries a charge opposite to their own charge. At this electrode, the charged particles will be neutralized and will coagulate as a precipitate. Colloids by OpenStaxCollege is licensed under a Creative Commons Attribution 4.0 International License, except where otherwise noted.